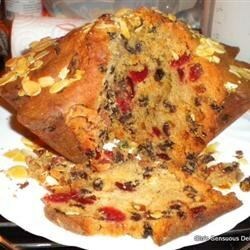 "This Dundee cake recipe uses candied fruit peel and candied cherries to make a delicious version of a Scottish Christmas favorite." Combine raisins, currants, mixed peel, cherries, and orange rind. Dredge with 1/3 cup flour. Cream butter or margarine and sugar until fluffy. Beat in eggs 1 at a time until light. Combine 1 2/3 cups flour, baking powder, and ground almonds; fold into batter mixture. Mix in fruit. Spread in foil lined 8 x 3 inch round pan. If using a different size pan fill 3/4 full. Bake at 325 degrees F (165 degrees C) for about 1 1/2 hours, until an inserted wooden pick comes out clean. Remove cake from pan. Toast almonds in 350 degrees F (175 degrees C) oven until lightly browned, about 5 minutes. Heat corn syrup, and brush over top surface of hot cake. Place almonds in whatever design you like. After cooling, cake will not be sticky. An excellent cake, packed with fruit and bursting with flavour! I have never made a nicer Dundee Cake. 5 out of 5!! Found out later this cake had nothing to do with The Office. I didn't make any changes to the recipe, it turned out amazing! The crumb is very light and the cake is not too sweet, which is just the way we love it. Excellent!!!! I added almond flour and put less all purpose flour. And I didn't have candied cherries but I did have.... candied ginger!!! ... and it was fantastic! Sooo good I will do it again!